We are one of the first funeral home in our area to offer interchangeable interiors in almost all of our caskets. For many years there were only two types of interiors offered in a casket. Those two interior options were velvet or crepe. We could not be happier to have partnered with Thacker Casket Company to offer an innovative and modern way to select a casket through their exclusive brand entitled Tailored Designs™ While some other casket companies offer custom interior designs, you have to wait for the production of the casket. In our case, you have several various options to choose from in our casket selection room, and the interior is interchanged at the North Little Rock warehouse prior to being delivered to our funeral home. How convenient! 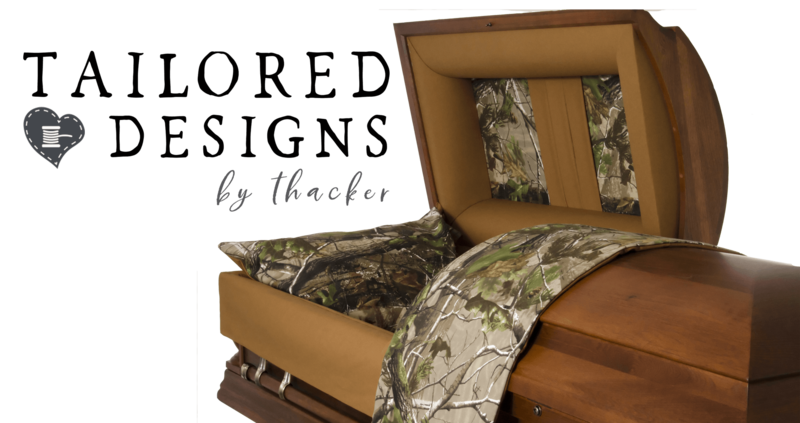 You can read more about the Thacker Caskets Tailored Designs™ by clicking here. Below are the Thacker Tailored Designs™ you can select for your casket in our selection room. For more information, contact our funeral planners at 501-796-2275..